21 | May | 2012 | Russ & Gary's "The Best Years of Music"
Gary: “I’m going to take you back, way back”, not really, but that was the opening line of this man and his group’s greatest success. I’m guessing that he was a Pop/Funk/Saxophonist, who made it big in 1972. He at one time replaced Frankie Lymon, played Sax on Dave “Baby” Cortez’s “Rinky Dink”. Although he only placed Three songs in the Billboard Top 40 his career transcended from the 50’s to the 80’s. A master of novelty/disco funk saxophonist, Jimmy Castor, started as a Doo Wop singer in New York. He wrote and recorded “I Promise to Remember” for Wing With the Juniors in 1956, a group whose roster included Al Casey Jr., Orton Graves, and Johnny Williams. Castor replaced Frankie Lymon in the Teenagers in 1957 before switching to sax in 1960. He appeared on several soul-jazz and Afro-Latin sessions and had a solo hit with “Hey Leroy, Your Mama’s Callin’ You” on Smash in 1966. 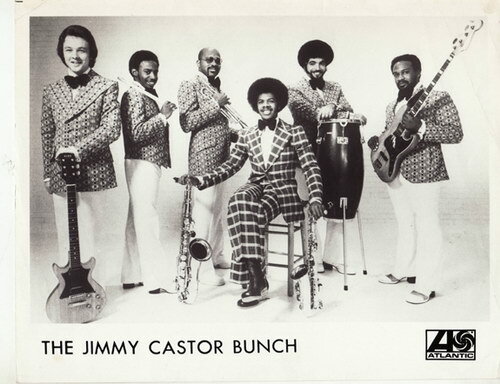 He formed the Jimmy Castor Bunch in 1972 and signed with RCA. Their first album release, It’s Just Begun, launched Castor’s next phase with the song “Troglodyte (Cave Man).” It was a Top Ten R&B and Pop smash hit. The Castor band included keyboardist/trumpeter Gerry Thomas, bassist Doug Gibson, guitarist Harry Jensen, conga player Lenny Fridle Jr., and drummer Bobby Manigault. Thomas left to join the Fatback band. Castor recorded as a solo performer from 1976 until 1988. He had one of his bigger hits in many years with a 1988 revival of “Love Makes a Woman,” which paired him with disco diva Joyce Sims. Castor had his own label, Long Distance, in the ’80s. He died in 2012 from heart failure.